Registration is an honor bestowed on historic properties by the state and federal governments. It recognizes the historic value of a property and encourages present and future owners to continue to exercise good stewardship. Owners of registered properties may donate historic preservation easements (which can reduce real estate taxes), qualify for the state and federal historic rehabilitation tax credits, receive technical assistance from department staff for maintenance and rehabilitation projects, and purchase plaques that mark the property’s significance. The Department of Historic Resources (DHR) and National Park Service (NPS) do not charge any fees for any part of the registration process. Costs may be incurred for items such as maps, postage, photo prints, photocopies, and other materials the author includes with the nomination packet. Many property owners successfully complete the Preliminary Information Forms and National Register of Historic Places nominations with advice from department staff. Others, however, may wish to pay a consultant to do the work for them. We suggest that they review our Consultants Directory and contact several consultants to compare estimated costs. There are costs associated with ordering a register plaque for a historic property, and, again, contacting suppliers and comparing estimated costs and designs is recommended. Are grants available for registering a property or for maintenance and repairs of a registered property? DHR currently offers no direct grants to property owners interested in registering their property or performing maintenance or repairs on a registered property. Information about various financial incentive programs for historic properties is available on our Grants & Incentives web page. Will anyone be able to stop me if I want to alter or tear down my property once it’s registered? Not as a result of registration. Property owners who donate historic preservation easements, participate in the federal or state tax credit programs, or accept a federal grant must abide by certain restrictions on alterations or demolitions associated with those programs. Otherwise, only local building codes and permit requirements must be satisfied, as with any property. The owners of the Captain Timothy Hill House, located in Accomack County, worked with a consultant in completing the state and national register nomination form. The house was successfully nominated to the Virginia Landmarks Register and the National Register of Historic Places. The Hill House, built circa 1800, is likely the oldest surviving house on Chincoteague Island. The house has been carefully restored, as is evident in this photograph. Some friends live in a historic district, and they tell me that they have to get permission from a board to repair their porch or paint their house. Will I have officials looking over my shoulder if I register my house? No. Only locally designated historic districts are subject to local zoning ordinances and procedures. Sometimes, a property or district may be listed at the national, state, and local levels but it is only the local designation that places restrictions on private owners. Do I have to open my property to the public if it is registered? No. Listing in the National Register of Historic Places or the Virginia Landmarks Register does not require that you open your house to the public. Will registration or listing increase or decrease my property values and tax burden? Many factors affect the value of real estate: location, improvements, supply and demand, zoning, surroundings, local and national economic conditions, business cycles, and actions of national, state, and local governments. Changes in any of these factors may increase or decrease the value of property. Registration per se appears to have little effect, although one would expect well-kept, attractive, older properties and neighborhoods to experience rising values over the long run. Can a property be nominated individually if it is within a district? Yes. However, property owners in districts already can receive the same benefits as owners of individually listed properties. In other words, if a property is listed as a contributing structure within the district, it is already “just as registered” as if it were listed individually. Can aluminum- or vinyl-sided buildings be registered? Yes. Although aluminum or vinyl siding is not a recommended treatment for historic buildings that predate the introduction of such siding (it conceals the historic fabric and may damage it through moisture retention), the national and state registers do not definitively exclude vinyl-sided buildings from consideration. A property must, however, retain physical integrity in order to be registered; non-historic and/or unsympathetic alterations tend to erode integrity. How are decisions made about what gets listed? The process consists of evaluation and nomination. During the evaluation phase, preliminary information about the property is examined by the DHR regional office and DHR’s Register Evaluation Committee, which then recommends to the State Review Board properties that appear to meet the criteria for registration. Once the evaluation phase is completed, property owners decide if and when they will proceed with a nomination of these qualified properties. 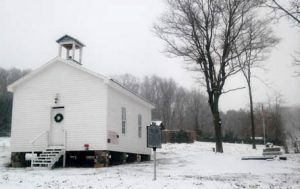 Longs Chapel, in Rockingham County, is a Reconstruction-era chapel and schoolhouse built circa 1870 by former slaves on land deeded to them to establish a church and school. It was the heart of a rural African American community, called Zenda, that existed during the latter quarter of the 19th century and the first quarter of the 20th century. The building, after years of neglect and abandonment, had nearly vanished before it was saved and listed on the state and national registers. It was restored after it was listed in the registers. Isn’t it true that only sites associated with famous people or events get registered? No. The Register criteria apply to places of local as well as of national or statewide significance. Many places are listed in the registers because they exemplify themes or architectural styles important in local history. If my property is listed in the national or state registers, will it be protected from undesirable development or destruction by government projects? Not necessarily. Only easements protect property in perpetuity. Registration informs owners, local planners, government agencies, and others involved in land-use planning of the existence of a historic resource. Neither the National Historic Preservation Act nor the Code of Virginia, however, requires property owners, developers, or government agencies to avoid affecting or destroying historic resources. The National Historic Preservation Act does require, however, that federal agencies take historic properties into account when planning projects. In many cases, state and federal agencies work around the historic property or mitigate the effects of a project on the property. However, in most cases, the federal or state project usually proceeds even if it affects or destroys the resource. In some instances, the force of public opinion has persuaded developers or government agencies to spare a registered property. Will I be able to leave my property to my children or to anyone I want if it is listed? Listing in the national or state registers in no way affects the transfer of property from one owner to another, or any other rights or responsibilities of property ownership. My property is included within the boundaries of a historic district even though my house is too new to be historic. Why can’t I just be left out of the district? significance of the complex.) These properties are included within the district boundary but are recorded as noncontributing. This has the same effect as “leaving them out” without compromising the integrity of the district as a whole.